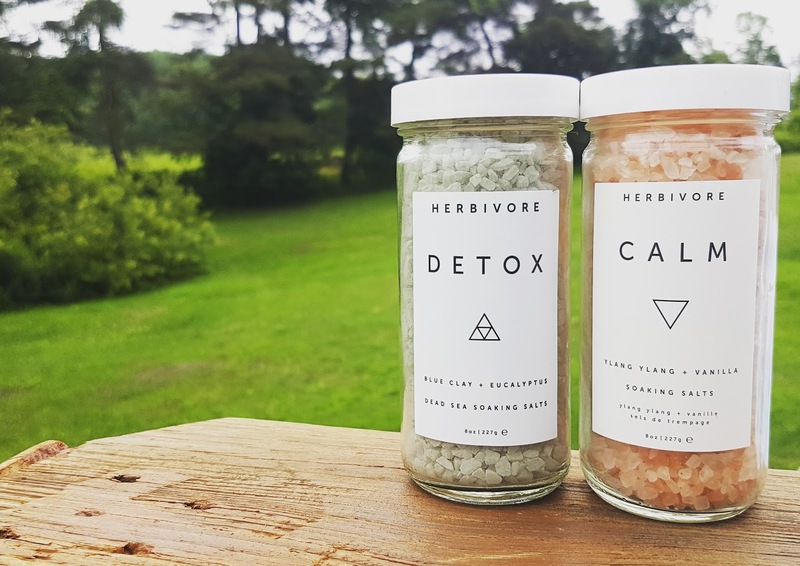 Herbivore Botanicals is a US based green beauty brand that is cruelty free, vegan, and free from nasties. Their products use plant-based food-grade cold-pressed oils, steam distilled therapeutic-grade essential oils, and GMO free soy wax, and as an added bonus all their packaging is recyclable and reusable. 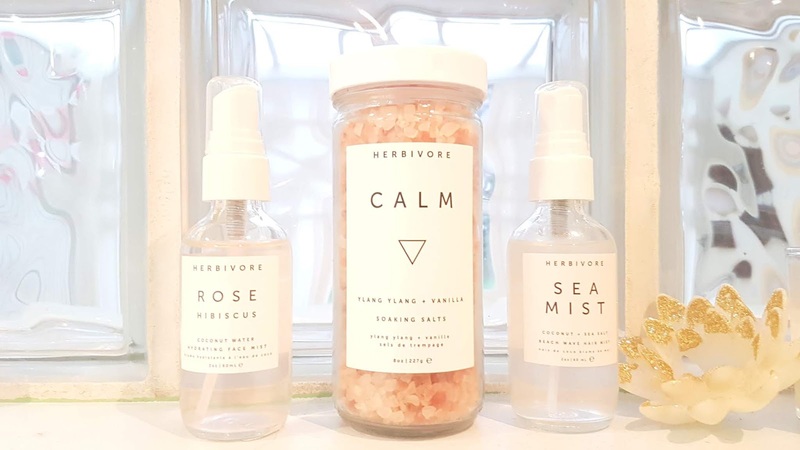 While their main focus is on effective skincare formulas, Herbivore also produces luxurious bath treats and beauty tools, making this a business that checks all the boxes for me. So of course I had to take this visit to my family in WNY as an opportunity to test out their range! I ordered a few goodies online so they would be waiting for me when I arrived, but also had an added surprise -- when we were all in NYC a week ago we popped into one of the latest stockists of Herbivore: Sephora. While the shop didn't carry the full range (boo! ), they did have some of the 'favourites' in the Up and Coming section of the store. Along with the goodies I actually ended up picking out, I got to test out the newly launched Prism Glow Potion and the Lapis Oil, plus check out the Moon Fruit Superfruit Night Treatment. Score!! The Prism Glow Potion was shockingly light -- it felt like silk when applying, and it sank into my skin so quickly (but not in a way that made me think it wasn't working effectively!). The bottle warned about a light tingling sensation which I was worried about since I do have slightly sensitive skin, but it didn't irritate me at all. 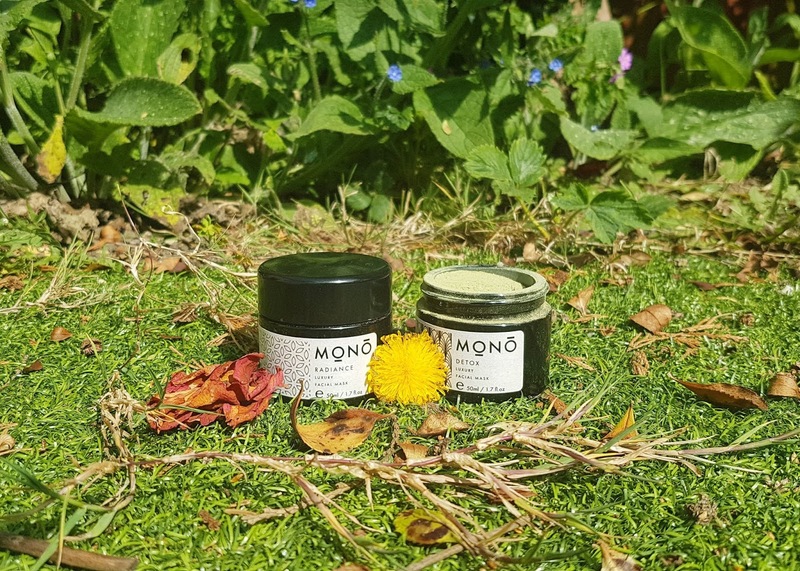 The potion is meant to help improve skin tone, soothe redness, plump up dull and tired looking skin, and clarify, all thanks to the natural fruit acid 5%. I really am kicking myself for not buying this, as I have since looked at all the reviews and it sounds brilliant! Ahh, next time. I will say that I am happy I got to test out the Lapis Oil, as it definitely isn't suited to my skin type, or at least not quite yet. The blue tansy oil is exquisite, but it is too heavy for my combination skin and I could tell straight away I would probably end up with some spots with regular use. This would be perfect for anyone looking to protect against age lines, hydrate dry skin, or calm conditions like psoriasis. 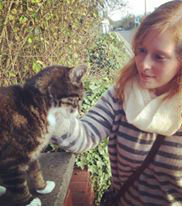 For me though, I think Phoenix would be more suited. Perhaps the product that intrigued me the most in Sephora was the Moon Fruit night treatment. This stuff is bold, and I don't just mean in terms of the claims it makes -- it is bright purple!! Like, vivid rave-shade purple. There are three colourings in this which give it its distinct look: indigo powder, ultramarine blue, and manganese violet. I personally would rather a plain and simple cream and would choose to go without any added pigments, but I will say it sure is eye catching. I didn't actually rub this into my face since we had to be out and about all day and it was super humid outside, but I tested on my hand and my first thoughts are that the formula is really rich and hydrating without feeling too heavy, but is a little hard to rub fully in. I may end up buying this in the future, as the reviews make it sound fab, but this time I did have to pass it up just to be sensible about my shopping. You probably already saw some of it over on Insta, but I grabbed two Calm Soaking Salts, one Detox Dead Sea Soaking Salts, the Rose Hibiscus Coconut Water, and the Sea Mist spray! I could have spent an absolute fortune if I had actually purchased every item that was in my cart, but I decided to be responsible and only get a handful of treats to start with. I will say I have been totally over the moon with all four items, and if the quality of these (plus the three products I tried in Sephora!) is anything to go by, then I think it is safe to say the rest of the range is just as wonderful. Rose Hibiscus Coconut Water: This facial spray is slightly different from the ones I usually reach for, as the base is aloe and coconut rather than floral. From my experience using this bottle, these give the water more hydrating properties than a standard rose hydrosol, but the formula is still light and refreshing. The smell is still gorgeously sweet, though there is a slight hint of antiseptic due to the added witch hazel, but overall I get just a light fragrance of rose and hibiscus. And unlike other coconut based skincare products, this water does not leave my combination skin spotting out at all. If anything, it helps keep it clear! I think this facial spritz is most suited for summer, as it keeps your skin hydrated without the need of heavy creams that can congest your skin during the hot and humid weather. I definitely want to get a larger bottle next time I order! Sea Mist Texturizing Salt Spray (Coconut): I don't often use hair styling products as I usually just let my hair go and do its own thing, but every now and again I like a good salt spray. I have used JMO's texturizing spray, but found myself wondering why I couldn't just bottle up some sea water on my next trip to Great Yarmouth instead of paying for a full bottle. Well, I had no such questions when it came to this little spray. Herbivore have created an item that is a fusion between a hair perfume and hair spray -- the formula is light and doesn't leave my hair feeling dry at all thanks to the aloe and coconut, and it smells so nice compared to other salt spritzes! It helps my hair keep its natural waves all day without leaving it crispy at all, and even gives a healthy shine without looking oily. Definitely a winner! Calm Soaking Salts: I love the scent of these SO much that I ended up buying a second jar almost immediately! The blend of ylang ylang and vanilla is seriously perfection; I can't get enough of it! And even better is how it feels and works on your skin -- the clay helps gently detox your body while you relax and breathe in the soothing essential oil vapours, and the soak leaves your skin clean and clear. This blend is delicate and luxurious with a touch of romance, and I love that the salt grain is larger than most bath salts as this means you can use less product and make the jar last longer. 100% worth the money, and I kind of hope Herbivore come out with even more variety since they've smashed this out of the park. Detox Soaking Salts: Unlike the gentle fragrance from Calm, Detox will most definitely clear your skin and your senses, as it is a much more in your face due to blue clay and eucalyptus. The scent is strong and not entirely pleasant at first, but luckily the scent is offset by fragrant lavender, making this an earthy option that still has a bit of dreaminess to it once in the bath. This blend is ideal for a morning or mid-day soak, as it is super refreshing and invigorating. I also find it perfect if you have a headache or cold, as it really helps relieve tension. Will I be picking up a second jar of these bath salts as well? Honestly, I think I will, as I love the grain of the salt and the aromatherapy benefits of the blend so much. Once you get used to the smell, Detox is actually pretty relaxing! What's up next for me? The Rose Quartz Body Oil and the Brighten Pineapple + Gemstone Mask are at the very top of my wishlist. They both look and sound totally gorgeous, and I think my skin will really get on with both formulas. If anyone uses my links down below, maybe I can even check these two out sooner rather than later -- then I can share my full thoughts on those with all you eco-lovelies too! And what is on your Herbivore Botanicals must try list?? Let me know which you are mooning over, or what treats you have tested from the range already -- I love seeing what you all think! Ready to shop? You can pick up your very own green goodies from Herbivore Botanicals direct from the brand if you live in the US, or from Space NK if you live in the UK. You can even grab 20% off your first USA order here, or £10 off your first Space.NK purchase here. What a way to grab even more all natural loveliness for less! The Calm Soaking Salts sounds like something I would enjoy having as I love soaking in the bath. These sound fantastic. I do love products which are free from nasties. Sounds like they have a great range. I might be interested in this... love the brands that are environmentally friendly. This range sounds amazing, will have to pop by Space NK for a little look! A vegan brand, that's what I love to read about. The mist sounds very good, I'd love to try it.